Welcome to the blog for Skovsøen, the Danish Language Village. Subscribe by email to receive notifications of new posts directly to your inbox. View all our photos here! The last full day of Skovsøen was a lot of fun! We woke up at the normal time, ate breakfast, and cleaned cabins. After raising the flag as a group, the videregående (credits) biked to Skovly for their final exam. The one- and two-weekers went to storegruppe (big group) and roteringsgrupper (rotating groups). The older villagers also got to go on a short bike trip to Skovly. When everyone returned, it was time for lunch! Lunch was smørrebrød (open-faced sandwiches). Unfortunately, this lunch was also the last day of our favorite Danish bread, rugbrød, (rye bread), which you really struggle to find in America. I will miss rugbrød! After lunch all villagers headed to cabins to nap. When they woke up, they filled out some evaluations and had some free time. The store opened in danske kroner (Danish Crowns) for the last time, with many villagers buying souvenirs to remember their time at Skovsøen. The villagers then went down to the beach to swim! The usual shower time was spent a little differently, because it was restaurant night! All villagers dressed up before going to dinner. At dinner, the villagers were served by the staff. They learned how to order in Danish. The food offered was Korean, which was wonderful! We are so lucky to have staff in our kitchen who can make the food from their culture for us. The evening program was talentaften (talent night) and a dance for the older villagers. We had some wonderful talents, including instrument switching (a clarinet player attempting to play a trumpet and vice versa) and a cat choir. 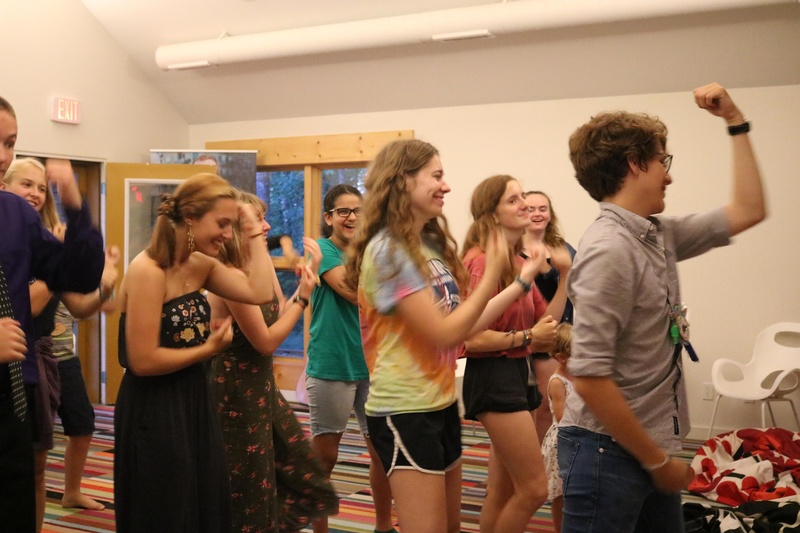 After a round of good nights, the younger villagers headed to bed while the older villagers danced the night away (until 10:15 pm, that is). The end of the night was bittersweet, with many hugs and a few tears. It was an amazing last full day at Skovsøen.